Harry S. Truman made his fair share of missteps throughout his presidency, but his decision to seize control of the steel industry during the Korean War forever marred his presidential legacy. 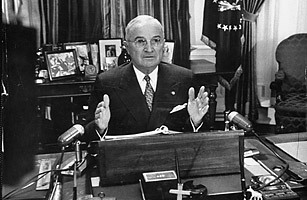 Concerned over wartime inflation, the Truman Administration imposed wage-price controls for industries that were considered necessary for national defense. These controls led to an ongoing contract dispute between the Wage Stabilization Board and the United Steel Workers Union, which wanted to raise both wages and the price of steel to keep up with increased demand. Truman personally requested an end to the impasse, but terms could not be met by the deadline so the steel companies moved to strike. To prevent a delay in the production of weapons that were needed overseas, Truman ordered his Secretary of Commerce to seize the mills. The seizure angered the steel companies, which claimed that the move was illegal. The Supreme Court agreed. In the 1952 case of Youngstown Sheet & Tube Co. v. Sawyer  known as The Steel Seizure Case  the court made a landmark decision to limit the president's power to seize private property. As for the steelworkers, they went on strike anyway, and after 53 days, agreed to similar terms that the union had proposed almost four months earlier. See inside the World Trade Center steel program.